“Saturday Night” was shot entirely on Nokia N95 mobile phones – some of it helped by shooting through magnifying glasses to create macro photography. 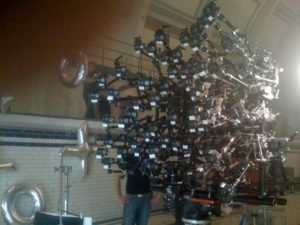 However most fun in the production of this viral / promo hybrid was the use of a giant rig of N95s: 64 mobile phones were mounted on a dolly to create mosaics of the band performing in front of them. You can view a little „making of“ here.